For most rally fans (myself included), the 80s was the most fascinating era of rallying for one pure and simple reason: Group B. During this period, Audi was constantly the team to beat, and for a while, the great Michele Mouton was one of the hired guns for this legendary team, and she was total business. I like to race cars. A lot. My personal quest is to successfully compete every major discipline of motorsport, and just about have. 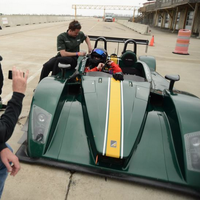 Pictured, one of the fastest vehicles I've been able to drive, my test session with the Caterham SP300R.